Black Lions: Fact or Fiction. The picture you see up top is photoshopped, but could there actually be a black lion? Well, after bathing in mud, a lion's fur will be soaked in blackish dirt that will make it's fur black. This effect only lasts one hour, then the fur is normal color. Leopards and Jaguars can have a deformality that will make their fur black. 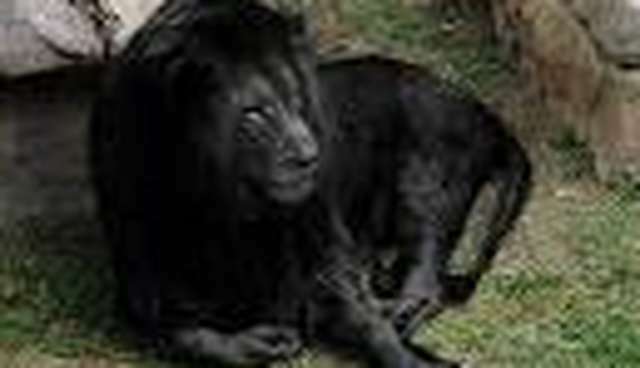 This could be mistaken for a black lion if not looked at carefully. When the sun is going down, and pointing directly at an object, you will only see the objects dark silhouette. A lion's dark silhouette makes it clearly the color black until the sun points in a different direction, again, that could make the lion easily be mistaken for a black lion. But is there a chance that their could be a lion that was actually and permanently black? Maybe, as a lot of the lion's relatives can be irregularly black, so there's no reason a lion cannot be, though there has never been an actual black lion seen in real life.